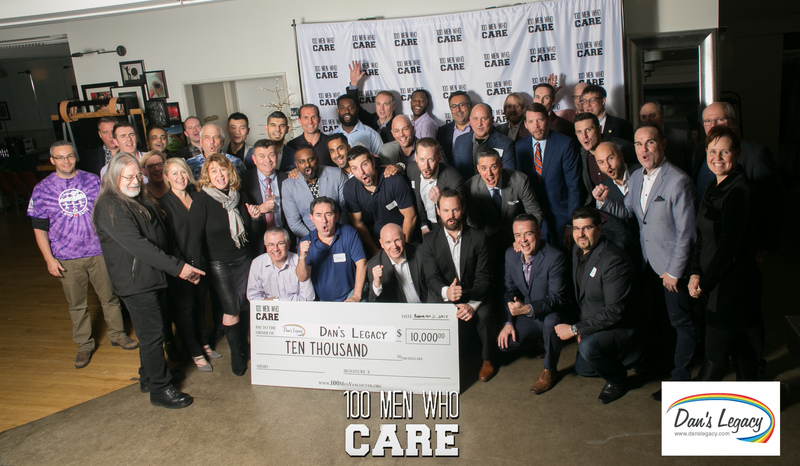 On Thursday, November 30, thirty-seven members of 100 Men Who Care Vancouver held a reception at the Donnelly Group Head Office and presented a cheque for $10,000 to Dan’s Legacy. The funds will go towards the charity’s counselling and life-skills programs for youth affected by trauma-based mental health and addictions challenges. Ryan Millar, co-founder and president of 100 Men Who Care Vancouver, says the organization’s members all share the same core values and understand that “A small act of kindness, combined with enough good hearts, can make a big difference”. Young people with trauma-based mental health and addictions issues are at high-risk for entrenched addiction, justice involvement, homelessness and suicide. Dan’s Legacy believes its harm prevention programs are the most sustainable and sensible solution to the opioid health crisis, and the charity reports a 50% success rate in helping its clients to lead healthy, substance-free lives while working towards meeting their education, safe-housing and life goals. If you or someone you know is asking for help, please visit www.danslegacy.com or call Tom Littlewood (Program Director) at 604-999-9136 or Barbara Coates (Executive Director) at 604-329-9186, or barb@danslegacy.com.